Donate and receive Bendib’s 1st book of 152 cartoons here! Learn a bit how media deception works. Take “the Cycle”. Click here to start and then click “Next” on the bottom of each page. It’s a short trip through the basics of media deception. “Here's a quiz for you: Name the best-known and most influential conservative commentators in America? Rush Limbaugh? George F. Will? Bill O'Reilly? Now, quick, who are their liberal counterparts? What will it take? - How Many More Lies Will the Media Tell Before We Stop Them? If You Get Your News From the Corporate Media: Just Shut Up and Listen!!! MEDIA, MURDER AND AMERICAN MORALITY! - TEACHING AMERICA TO ENJOY THE KILL! A Guide to Responsible News Watching! - Download this guide to so that will help you understand when and how you are beig deceived. Independent Online Edition Americas - Federal authorities are actively investigating dozens of American television stations for broadcasting items produced by the Bush administration and major corporations, and passing them off as normal news. Some of the fake news segments talked up success in the war in Iraq, or promoted the companies' products. Fake TV News Widespread and Undisclosed - A multimedia report on television newsrooms' use of material provided by PR firms on behalf of paying clients - The VNRs and SMTs whose broadcast CMD documented were produced by three broadcast PR firms for 49 different clients, including General Motors, Intel, Pfizer and Capital One. In each case, these 77 television stations actively disguised the sponsored content to make it appear to be their own reporting. In almost all cases, stations failed to balance the clients' messages with independently-gathered footage or basic journalistic research. More than one-third of the time, stations aired the pre-packaged VNR in its entirety. 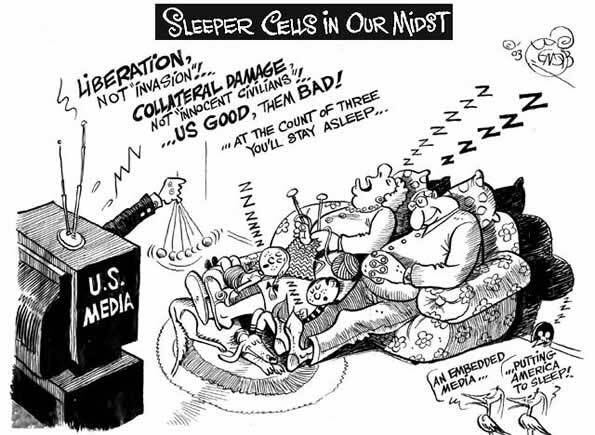 Your Media is Killing You - The American mainstream television news media, in whole and in part, has catastrophically failed the American people and is singularly responsible for the untimely deaths of tens of thousands of innocent people. - Meanwhile, during the period beginning with the O.J. trial and concluding with the impeachment extravaganza, the Taliban was taking control of Afghanistan in the wake left by the completion of our anti-Soviet policies in that nation. A man named Osama bin Laden was preparing to attack anything and everything American he could get close to. UNSCOM weapons inspectors under Scott Ritter were taking Iraq's chemical and biological warfare capabilities apart literally brick by brick, and the sanctions against that nation, which were killing hundreds of thousands of civilians, were also reducing Saddam Hussein's conventional arsenal to a large collection of formidable paperweights. Disease mongering Restless Legs Syndrome A case study of how the media helps make people sick (PLoS Medicine) - Unless journalists approach stories about new diseases skeptically and look out for disease mongering by the pharmaceutical industry, pharmaceutical consultants, and advocacy groups, journalists, too, may end up selling sickness. Ex-Watergate writer laments 'idiot culture' - Former Washington Post reporter Carl Bernstein told about 200 people in Tampa that today's media is more gossip and trash than news.- Bernstein, the former Washington Post journalist who, along with fellow reporter Bob Woodward, unearthed the Watergate scandal that led to the resignation of President Richard Nixon, said much of today's news has deteriorated into gossip, sensationalism and manufactured controversy. - That type of news panders to the public and insults their intelligence, ignoring the context of real life, he said. Good journalism, Bernstein said, "should challenge people, not just mindlessly amuse them." - Bernstein also turned his attention Thursday to the coming election, calling President Bush "the most radical president of my lifetime and perhaps in the century." - Bernstein said Bush "is radical in every degree," from a favoritism of the wealthy to a pre-emptive foreign policy to a lack of concern for civil rights. Second world press freedom ranking - 2003 Index - United States and Israel singled out for actions beyond their borders - Reporters Without Borders is publishing its second world press freedom ranking. As in 2002, the most catastrophic situation is to be found in Asia, especially North Korea, Burma and Laos. Second from last in the ranking, Cuba is today the world's biggest prison for journalists. The United States and Italy were given relatively low rankings. - Special situation of the United States and Israel The ranking distinguishes behaviour at home and abroad in the cases of the United States and Israel. They are ranked in 31st and 44th positions respectively as regards respect for freedom of expression on their own territory, but they fall to the 135th and 146th positions as regards behaviour beyond their borders. - The Israeli army's repeated abuses against journalists in the occupied territories and the US army's responsibility in the death of several reporters during the war in Iraq constitute unacceptable behaviour by two nations that never stop stressing their commitment to freedom of expression. The stupefaction of a nation: Corporate media propaganda and its weapons of mass distraction - Propaganda in this nation has never been more incessant than today. From the hundreds of lies, misrepresentations and deceits being told to us by both government and corporate media about battles, deaths, injuries, the resistance, security and the deteriorating state of the occupation of our quagmire in Iraq to the distortions and chicanery the Bush administration seemingly launches at us in wave after wave of lies to the purposeful distortion and omission by corporate media of the corrupt going-ons of the embarrassment and scandal that is the bordello called Congress. WHAT WE REALLY NEED - LOOK HERE - WE CAN TAKE ACTION! Discuss Media Lies - Visit the NEW TvNewsLies.org reader BBS forums. Tim Robbins speech to the National Press Club - BRILLIANT! You can view the video at c-span.org. Public Remains Skeptical of News Media - Majority of Americans believe news organizations often get facts wrong - TVNL comments: Skeptical? They should be outraged! U.S. media's negligence threatens our democracy - Uncounted stories of magnitude and relevance go untold by a negligent and conflicted United States press -- the disgrace runs deep. Our government controlled press - CIA Origins - American government utilized radio during WWII with Voice of America and Radio Free Europe during the Cold War. Both programs started out as justifiable, freedom-inspiring endeavors. America's shame: A public happy to be conned - TVNL points out: It is the media that is pulling the con job! News media abandon historic role -- and public suffers - Millions of Americans accept what they are told and think they understand what they see. And what they are told and what they see is most often news as a manipulated commodity. But the facts that really count rarely reach a significant number of the public's ears or eyes. - Also, most reporters know governments lie, mislead and deceive. They also know that the press is ostensibly there to keep an eye on governments, to dissect errors and omissions by offering more truthful counter-narratives. Democracy Dumbed Down! - With the news media abandoning its duel function of being a watchdog of government and informing the public, while embracing news as entertainment for the highest ratings, citizens are uninformed and democracy is crippled. Rethinking Objective Journalism - Journalists (and journalism) must acknowledge, humbly and publicly, that what we do is far more subjective and far less detached than the aura of objectivity implies – and the public wants to believe. If we stop claiming to be mere objective observers, it will not end the charges of bias but will allow us to defend what we do from a more realistic, less hypocritical position. Bush's Four Horsemen - People are beginning to grasp and resent the attempt by the Federal Communications Commission to allow the Four Horsemen of Big Media — Viacom (CBS, UPN), Disney (ABC), Murdoch's News Corporation (Fox) and G.E. (NBC) — to gobble up every independent station in sight. Media lose access to information - Government clamps down on what's allowed out in name of national security - Indeed, in two years since the terrorist attacks, journalists across the country have found themselves losing access togovernment-held information on various matters -- much of which has nothing to do with national security. Al Gore Would Rather be Ailes than President - "He thinks the country is disserved by the absence of truth in news, by the absence of honesty in public-official presentation, by the apparently infinite cynicism of those who currently hold high office,"
Bill Moyers is Insightful, Erudite, Impassioned, Brilliant and the Host of PBS' "NOW" - A BUZZFLASH INTERVIEW - But for right now, you don't need to turn on the television to partake of the incisive, erudite perspective that Bill Moyers brings to an understanding of what's gone wrong with today's media. For right now, Bill Moyers will enlighten you right here on BuzzFlash.com. NRA looks to buy media outlet, be exempt from election rules - Hoping to spend as much as it wants on next year's elections, the National Rifle Association is looking to buy a television or radio station and declare that it should be treated as a news organization, exempt from spending limits in the campaign finance law. - If the NRA were to be considered a media organization, it would be free to say what it wanted about candidates at any time and spend corporate money to do so, such as for commercials. Media Censorship That Doesn't Speak Its Name - Reducing journalism to a branch of corporate and government public relations is the hidden agenda of the media deregulators, in Britain and America. Journalists faced 'record censorship' in 2003 - RSF says that "arrests of journalists and censorship of media reached a record high in 2003," and that this is "undoubtedly linked to the fight against terrorism and to anti-terror laws adopted by some countries since the 11 September attacks". Media Spin Can Separate War From Death - A dozen years after the Gulf War, public perceptions of it are now very helpful to the White House. That's part of a timeworn pattern. Illusions about previous wars make the next one seem acceptable. As George Orwell observed: "Who controls the past controls the future; who controls the present controls the past." Group List Underreported World Stories - ``It's clearly a valid criticism when applied most broadly to the American media” - Nicolas de Torrente, the executive director of the U.S. branch of MSF, also known as Doctors Without Borders, told The Associated Press that the list focuses on U.S. news coverage because American media underreport international events in general, except for security issues and the Middle East. US Media Review: Journalism’s Imbalanced Objective - Journalistic standards are evolving. The Society for Professional Journalists’ Code of Ethics refers to journalists “seeking truth and providing a fair and comprehensive account of events and issues.” – in other words, they seek an objective account of relevant facts. Unfortunately with the advent of advocacy news services, the journalistic standard of objectivity has been subsumed into a desire to be viewed as “balanced”. Journalists Not Loath to Donate To Politicians - Media Companies' Policies Vary Widely - More than 100 journalists and executives at major media companies, from NBC's top executive to a Fox News anchor to reporters or editors for the Washington Post, Wall Street Journal, New York Times, USA Today, CBS and ABC, have made political contributions in recent years. - Melanie Kirkpatrick, associate editor of the Wall Street Journal's editorial page, donated $20,000 to the Republican National Committee and $1,000 to Bush's 2000 presidential campaign.- TVNL Comment: Isn't it enough that they provide free infomercials disguised as news to the Bush/PNAC administration? Journalist Novak Poking Fun at CIA Leak - Dressed as Wilson in top hat and cutaway coat, Novak sings of himself: ``Novak had a secret source ... so he outed a girl spy the way princes of darkness do. ... Now John Ashcroft asks Bob who and how, could be headed to the old hoosegow.'' - TVNL Comment: This leaves us speechless. Robert Novak should be fired and never permitted to work again as a journalist as a result of this. He thinks it is funny that he outed a CIA agent and that the White house is involved? Outragous! AP president proposes media lobby to fight government secrecy - Denouncing increased official secrecy, Associated Press President and CEO Tom Curley unveiled a plan Friday for a media advocacy center to lobby in Washington for open government. - "The powerful have to be watched, and we are the watchers," Curley said, "and you don't need to have your notebook snatched by a policeman to know that keeping an eye on government activities has lately gotten a lot harder." - At every level of government, records are being sealed and requests for information denied, and courts are imposing gag orders and sealing documents, Curley said, speaking in the Hays Press-Enterprise Lecture series. - "The point I want to make with these brief examples is an elemental one: The government's power is overwhelming. Its agents are armed and authorized to use force if they have to," Curley said. - "News is our business. We are the watchers," Curley said. "Open government is the personal interest and constitutional right of every citizen. But we of the fourth estate have by far the greatest means and incentive to speak and fight for it." - TVNL Comment: BRAVO! Simply BRAVO! Inter-American Press Association Criticizes U.S. Press Restrictions - The Inter-American Press Association criticized the U.S. government on Sunday for placing restrictions on foreign journalists' travels and for recent court rulings ordering reporters to reveal secret sources. Media monster killer - The mainstream news media, Moyers laments, has taken a dive at a time when the power of the Republican Party has never been more absolute and more morally bankrupt. As a result, public discourse has been reduced to a scream-fest dominated by such unabashedly conservative media giants as Fox, Clear Channel, and Sinclair, who’ve become “echo chambers” for the Bush administration, if not outright propagandists.